Hard floor under his back, extreme darkness surrounded him as he was not sure if his eyes were open. He focused for a second, tried to remember why is he lying on the floor, but nothing came to his troubled mind. Moved his hands around, waved them up above, but nothing was there. He got up on his knees, tapping his hands on the cold floor to make a way and suddenly, light flashed all over the place. He tried to cover his eyes with his elbow, waited for a minute so his eyes could get used to the light, and opened them to have a look around. He was in a room of white and smooth walls. But something was missing. With a frown conquering his crumbled face, he searched thoroughly for the door of this room, but there wasn’t any. There wasn’t even a window. To his amazement, light came from nowhere. It was just there filling the creepy room. Putting his thumb and two other fingers, he squeezed his forehead trying to summon reasonable answers. How did he get in here? Why? When? And even where is he? But these were questions he couldn’t answer. Black visions roamed his head. Reaching the more static questions, panic was taking place. Who is he? Who was he? What is he turning into? Only the echo of his questions thundered in his head. He doesn’t remember existing before. He doesn’t have whatsoever knowledge. An empty vessel worth nothing to fill it with. He must escape this nothingness and get out to existence. But fear is taking over. What will be waiting for him out there? What should he expect to find? Starting to exist? There might not be any place for him to fit in. With the drums of these thoughts, a squared crack started to paint itself on one of the walls. But, no! He will not escape. He must stay and maybe fade away. At this very thought, the walls started to dissolve. The floor turned into millions of pixels and his balance was running away from him. He is falling down. No, he is not falling, he is fading away. Darkness is eating him, swallowing him into a deeper level. Maybe it is too late to fight it now. His last thought turned into dust, scattered in chaos, and it was only darkness again. I will put my hand on this pillow, lay my cheek on that hand, grab my knees closer to my chest, and try falling asleep. Something is wrong with my bed. Your smell laid no more on my pillow, your fingers swayed no more on my forehead, and your breath traveled no more on my chest. And something is wrong with my room. My stairs drummed no more with your steps, my door trembled no more with your dancing fingers, and my walls echoed no more with your laugh. And something is wrong with me. Your frown faced no more my jokes, your fingers trembled no more in my hand, and your gaze met no more my eyes. So I close my eyes, squeeze them to see you there, between them and their lids. I calm down, to find your smile hanging on my curtains. I turn around to confront your shining eyes in the darkness. And there you are, sitting in the corner of my heart, unrevealing yourself until its the right time. And there my eyes relax, my body surrenders, sleep must be on the way. My eyes are heavy, the voices from outside are gone. And then I open my eyes, my body tightens, I hear your voice, I hear your calling. I call you back, I’m here, I’m Here, where are you? There is my hand reaching out to you, there is your voice fading away, there are your steps thundering away. 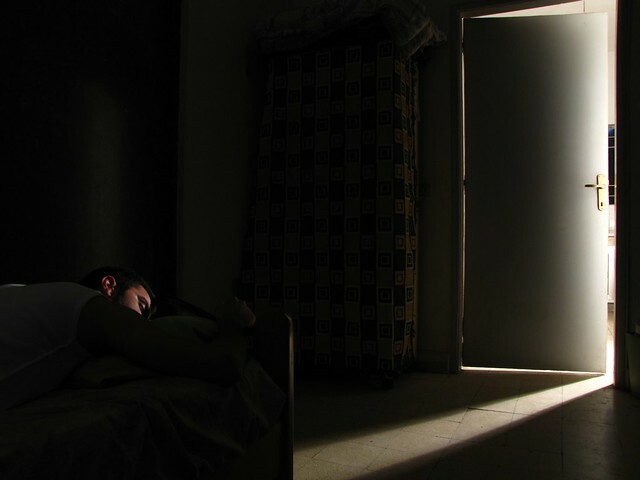 I open my eyes again, the pillow is wet, the bed is empty, the room is dark, and I am all alone. I close my eyes again, I squeeze harder, I search for you again, but you are gone. Did you knock and I didn’t hear it? I jump out of my bed, open the door, and its just that empty dark alley, with that broken lamp. I should have fixed that lamp, maybe darkness made you change your mind, maybe you are down there waiting for me. I run the stairs down, pop up in the street, and there it is empty. My tears are falling, I have to get back. I will not stop crying, maybe my tears will lead you to me if you forgot where my house is. I will stay awake, I will watch the road, maybe you will come from that end, and with you sunrise will come. I will stay awake and wait. نُشرت في يونيو 2, 2012 مايو 21, 2016 التصنيفات Short Storiesالوسوم Loneliness, Loss, Love, Nature, Sorrow, Treeاترك تعليقًا على What Do We Know! Curled in bed, bleeding tears, wrapped in darkness, and loneliness is his only friend. “Will it end soon”? He starts to think! He does this to himself. It cures him to get his feelings down. It cures him to draw tears out of his eyes. Maybe because at daytime he believes that life is great. Maybe if he cried his nights, he would laugh his days. He rolls back his day, his moments, in his head. How many shared a smile with him? How many shared a laugh? But no one to share his meals with. He eats alone, and chokes with every bite. Moon rays crawl inside, sweet and soft humming floats from outside. He must go out. As soft breeze moves forward, touching his skin, cooling his cheeks, putting the remaining tears back to where they belong. He walks down the road, puts his hand out, above the rising plants. Calmness reaches his head and peace gets into his heart. So much to scream out, yet no one to share the burden with, no one to give a hand in this heavy carriage. Suddenly, he notices the only friend that has always been with him. Never demanded a thing in return. Never complained and has always been there under the sunlight, it’s there, under the moonlight, it’s there. “Oh dear friend” he says. A joyful tear slips out, “If you could only talk to me” he says. And there he stays, his unconditional friend, his unconditional shadow. Silent, anticipating, and un-revealing.